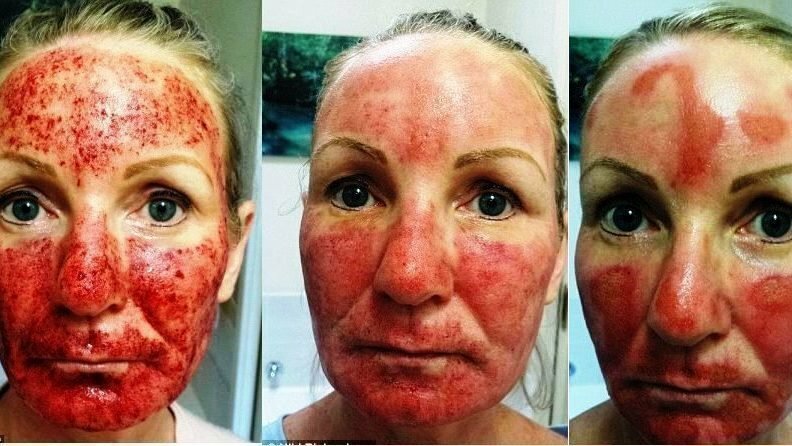 A Victorian woman has been left without compensation after a nightmare experience at a laser clinic left her bleeding from her entire face, and permanent scarring. Niki Richardson was enticed to have ‘erbium laser resurfacing’ when she saw a Mornington clinic advertising a discount deal. Speaking to The Leader Richardson says she didn’t expect the procedure to be painless, but she wasn’t prepared for the extreme agony she had to endure. ‘It was extremely painful but I decided to clench my teeth and soldier on,’ she told the Mornington Peninsula paper. Richardson was so concerned about her bloodied, injured face that she consulted Dr Sally Shaw, the medical director of Peninsula Skin Cancer Centre, who was horrified. Now, Richardson has decided to walk away from her compensation claim despite the injury and stress caused her. ‘I’ve also been told that because my injuries didn’t result in permanent damage, I didn’t have a case,’ she told The Leader.